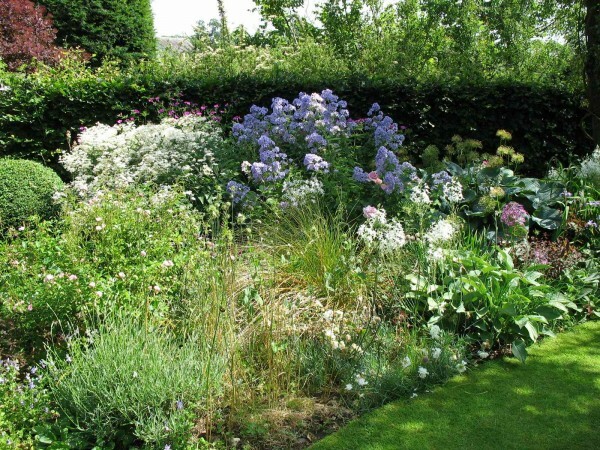 Wappenham held its open gardens event last weekend. What fantastic weather for it! The previous event was spoilt by rain. 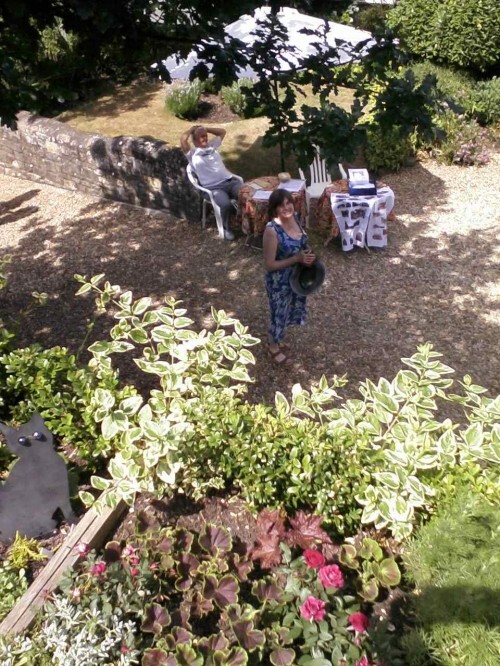 Just as well it was fine, as there were many gardens open and many other events, including luscious ‘Gilbert Scott’ teas (Gilbert Scott was brought up in the village, and has designed some houses and the old school). Here’s a selection of views. 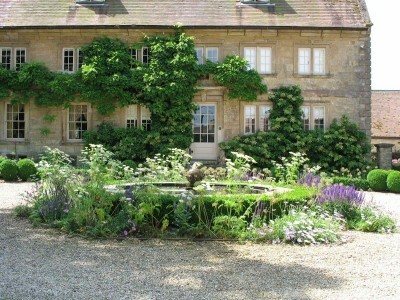 Here is the front of Wappenham House, with planting and the fountain feature designed by James Alexander Sinclair. Earlier in the year there are orange geums and purple alliums here, and they all go well together. 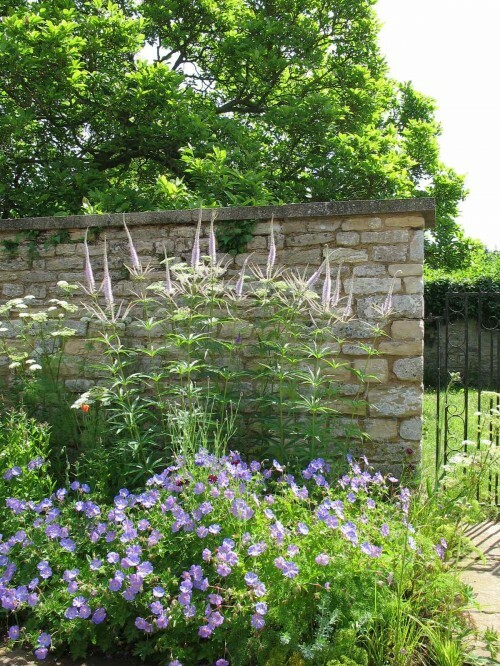 Here is a nice combination in the front garden shade – the veronicastrum is quite sculptural and I’d like to use it in my own garden somewhere. Coming round the corner of the house. 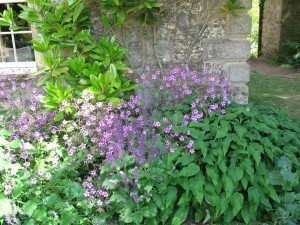 Here’s a good plant combination – not sure which geranium! 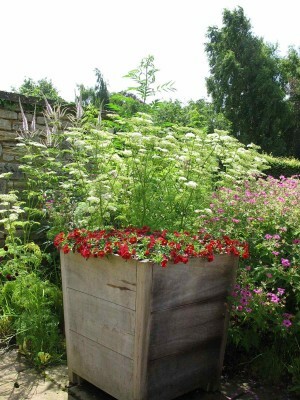 Here’s a nice container planting. Here is the veronicastrum again, highlighted by the sun. 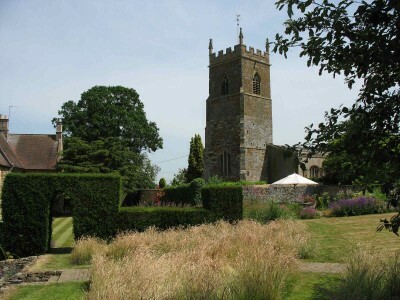 Our church viewed from the gardens, with a grass meadow in the foreground. 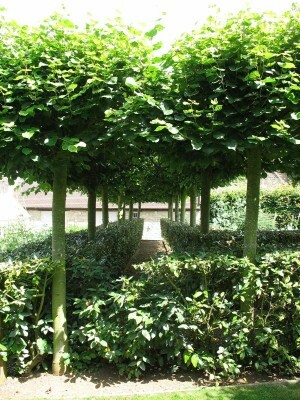 Pleached trees – limes – dividing the swimming pool area from the vegetable garden. 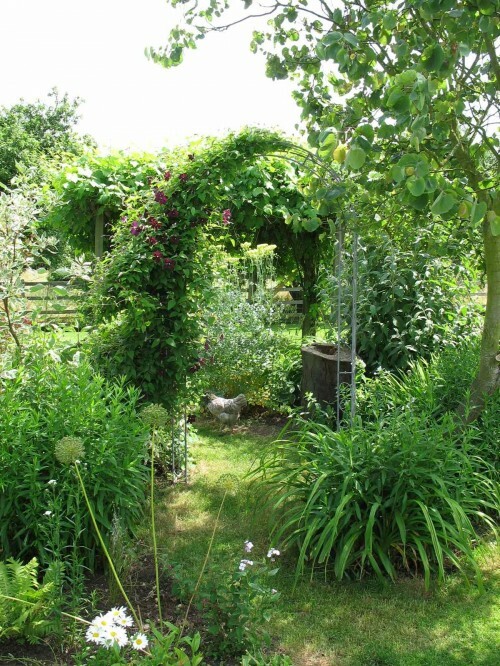 Another garden this time – a less formal one for a family with four children – and hens! The plants are surviving well. Amanda says that this is because they are planted out when already fairly big plants. 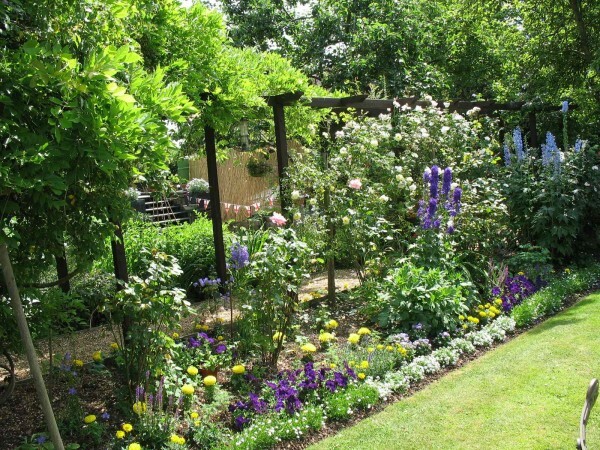 Another smaller cottage garden, with pergola covered with wisteria, and a good combination of bedding plants below. Anthony is always adding useful features to the garden. 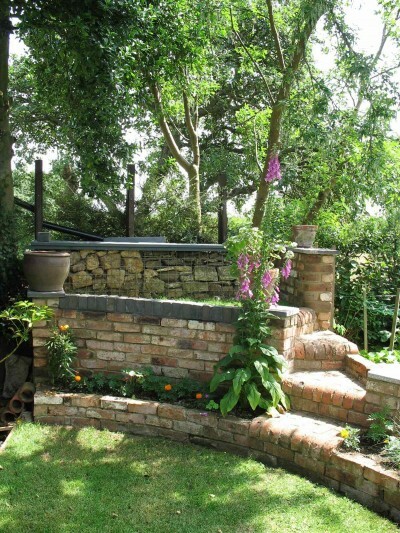 The purpose of this one is to sit with gin and tonic and catch the evening sun. 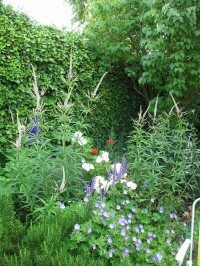 Then there is a wonderful plant enthusiast’s garden, with herbaceous clematis next to campanula lactiflora. 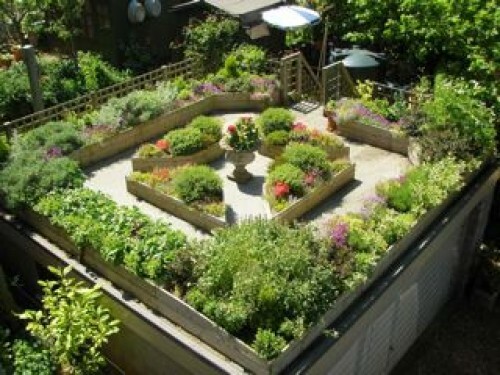 Finally there is the roof garden at Stone Cottage – what a great idea! There are steps up to it, and strawberries growing on top. Miniature roses give colour to the many small shrubs making the beds. 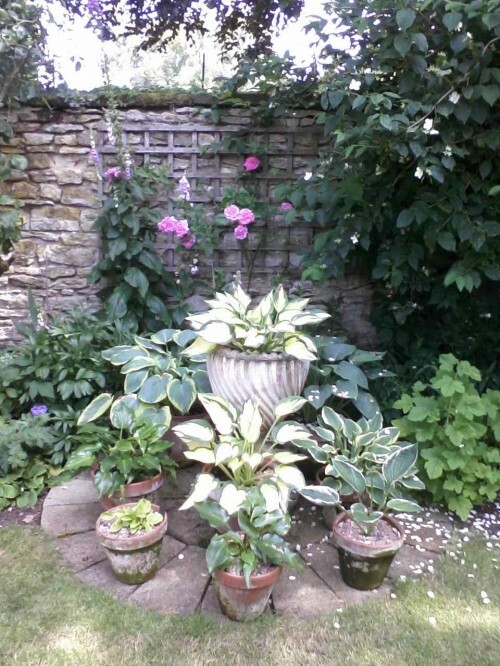 And a lovely display of hostas in the same garden to finish our tour. 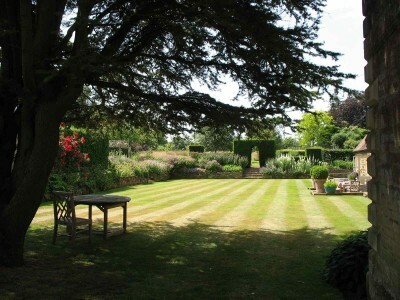 I came across this blog by chance and loved the photos of Wappenham Manor garden. My grandparents lived there and it was Granny who first gave me a love of plants. She was Heather Muir of Kiftsgate’s sister. My parents are buried in the churchyard. Next post: Pond Wars – or how I Learnt to Stop Worrying and Love the Pond!